Question: What is routing table? Routing table is actually a table that shows you the routes that you have set on the Windows OS, network routers or other network devices. The computer or network devices will know how to do routing based on this routing table. 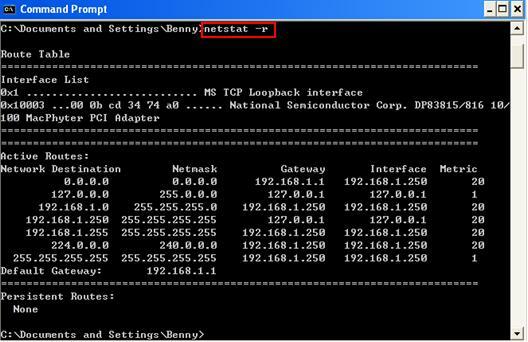 Here is an example of routing table in Windows OS by just opening the command prompt and then type netstat –r or route print. Quite simple to understand it, the computer will send the network packets to the Gateway that tie to particular Network Destination. Example again, the computer will send the network packets to 192.168.1.250 if the destination is in 224.0.0.0 multicast network. Please note the gateway shown with network destination 0.0.0.0 is default gateway. If no specific route found, all the network traffic will be sent to default gateway for routing.